The Guards is a film that isn’t bad but doesn’t really manage to be more than a pleasant diversion while it was probably hoping to be a cult classic. The characters, setting and story have the potential to be interesting: an unorthodox, slightly corrupt Irish policeman, Sergeant Gerry Boyle (Brendan Gleeson) in a quirky, rural County Galway community finds himself at the heart of a multibillion dollar drugs smuggling inquiry. He’s teamed up with FBI special agent Wendell Everett (Don Cheadle) and up against a trio of nasty characters Clive Cornell, Francis Sheehy and Liam O’Leary (Mark Strong, Liam Cunningham and David Wilmot). His only significant relationship is with his terminally ill mother, Eileen (Fionnula Flanagan) and some affection for prostitute, Aoife O’Carroll (Dominique McElligott). Mix in some jet black humour and it’s a summer sleeper hit winner that will turn its budget into a huge pile of cash. Think Local Hero, Hot Fuzz or In Bruge. It must have looked like that on paper to the seven production companies that funded it. The films main problems can be seen on the poster – a cast of almost interesting characters that end up in little bubbles and a desire to be funny which it never really achieve. The chief problem is that it wants to be a character piece but the characters are all a bit too disposable. Its thin plot would provide a nice scaffoling for some real nice bits of acting but it never really lets the characters get going. Boyle and Everett need more time on screen together building their characters. They start to have something and then are split up until the end of the film when they’re brought back together for the climax. Along the way various characters pass through Boyle’s life just long enough that you want to see more of them. Certainly when they are together the “chemistry” mentioned on the poster is there but they’re just not together enough. In parallel to the police we get a few scenes with the criminal trio as they corrupt the Garda, kill some people and go about smuggling a boat load of drugs into Ireland. Sadly they are saddled with some sub Tarantino wittering as they debate philosophy in a car and then life in front of a shark tank at an aquarium. The secondary problem is that if you’re going for darkly humorous you need to be actually funny. There are a few places this was amusing and a few it raised a laugh from someone in the small audience at the cinema I saw it in. It had opportunities but it didn’t take them. What the reviewer who said it was “A Raucous Comedy” thinks Raucous means I don’t know but it’s not how I’d describe it. There is some nice cinematography of rain-swept County Galway. I can’t really say the music has stuck with me long enough to be remembered. The story has a slightly ambiguous ending – maybe there was a wrap up after the credits but I wasn’t bothered enough to sit through them to find out. 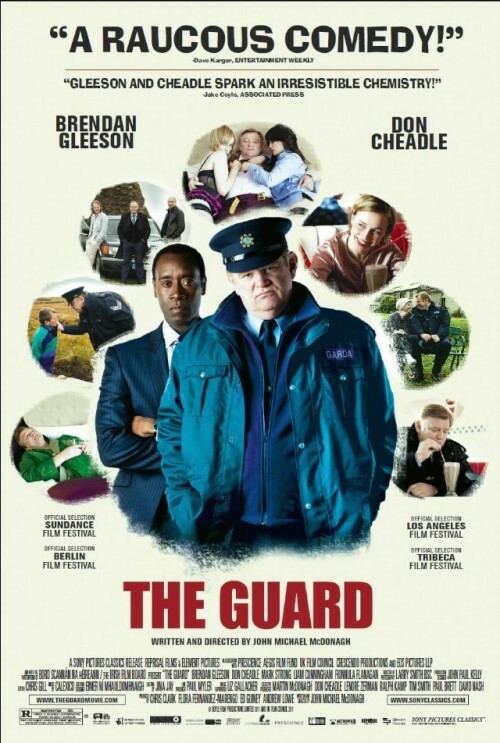 Overall I thought The Guard was an alright film but I was disappointed. With a stronger script the central and incidental characters could have been more interesting and hence funnier. I’m sure that the makers will be hoping it becomes a cult classic and that strong DVD sales will make it into a profitable success but I think they’ll be disappointed.